Protect your data center from fires with Fireline! Data centers are an extremely important part of maintaining your business. Not only do they cost thousands of dollars to build and run, these centers also keep your business running by continually backing up data. 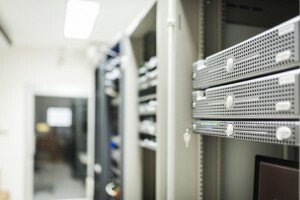 To protect your business’s data, it is important to outfit your data center with the correct fire protection equipment. So what kind of fire suppression systems to you need for your business? Read on to find out! While traditional fire protection is in place for life safety purposes, data centers require an extra form of protection – namely equipment protection. The nerve centers of most any business a data center must be fully operational at all times to prevent business downtime and lost revenues. This means a fire suppression system that not only protects lives but the equipment as well. Sprinkler systems, while useful in many applications, can do more harm than good if placed over a data center. You wouldn’t pour water on your smartphone, so you likely wouldn’t pour water on your server room either. By using a special hazard fire suppression system, your data center will be kept dry and safe from fire damage and moisture. So what kind of agent should you use? Gas suppressants are extremely effective in guarding your data center against fires. Clean agent systems such as FM200 and Novec 1230 extinguish a fire without damage to equipment that traditional sprinkler systems may cause. These systems are safe for the environment and human life and are highly effective when installed properly. Tied to a fire detection system these systems remove heat from the fire, extinguishing the fire without damaging any equipment. No cleanup is needed and your system that is not damaged will continue to operate, preventing downtime. Protecting your data center is extremely important. So why isn’t yours protected? Call Fireline for more information on protecting your data center today! This entry was posted on Monday, May 9th, 2016 at 4:39 pm. Both comments and pings are currently closed.